Looking for a way to keep fit, stay limber or lose weight? A diet of regular exercise can help. Which exercise is best? The one you're really going to do. For some people, that means working out at home on exercise equipment. If you're considering buying exercise equipment, the Federal Trade Commission (FTC) offers this advice: Evaluate advertising claims for fitness products carefully. The FTC has sued marketers of electronic abdominal exercise belts for claiming that users could get "six-pack abs" and lose inches in a short time. The Food and Drug Administration has never cleared any kind of electronic abdominal muscle stimulator for weight loss or obtaining "rock-hard" abs. While some electronic muscle stimulators may temporarily strengthen, tone or firm muscles, they will not lead to major muscle-toning or a major change in appearance. 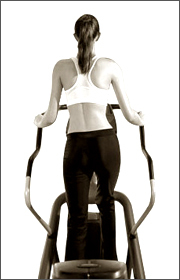 Ignore claims that an exercise machine or device can provide long-lasting, easy, "no-sweat" results in a short time. These claims are false: You can't get the benefits of exercise unless you exercise. Don't fall for claims that a product can burn fat off a particular part of the body - for example, the buttocks, hips or stomach. Achieving a major change in your appearance requires sensible eating and regular exercise that works the whole body. Read the ad's fine print. The advertised results may be based on more than just using a machine; they also may be based on restricting calories. Be skeptical of testimonials and before-and-after pictures from "satisfied" customers. Their experiences may not be typical. Just because one person had success with the equipment doesn't mean you will, too. Do the calculations when you read statements like "three easy payments of ..." or "only $49.95 a month." The advertised cost may not include shipping and handling fees, sales tax, and delivery and set-up fees. Find out the details before you order. Get details on warranties, guarantees and return policies. A "30-day money-back guarantee" may not sound as good if you have to pay shipping on a bulky piece of equipment you want to "return to sender." Check out the company's customer and support services. Call the advertised toll-free numbers to get an idea of how easy it is to reach a company representative and how helpful he or she is. Stretching exercises are thought to give you more freedom of movement to do the things you need to do and the things you like to do. Stretching exercises alone will not improve your endurance or strength. Stretch after you do your regularly scheduled strength and endurance exercises. If you can't do endurance or strength exercises for some reason, and stretching exercises are the only kind you are able to do, do them at least 3 times a week, for at least 20 minutes each session. Note that stretching exercises, by themselves, don't improve endurance or strength. Do each stretching exercise 3 to 5 times at each session. Slowly stretch into the desired position, as far as possible without pain, and hold the stretch for 10 to 30 seconds. Relax, then repeat, trying to stretch farther.